I am an expert vascular consultant with a particular interest in varicose vein treatments such as foam sclerotherapy. I work from Nuffield Health, The Grosvenor Hospital. Consultant Vascular and Endovascular Surgeon, Countess of Chester Hospital NHS Foundation Trust. Mr Sameh Dimitri does not hold a share or financial interest in this hospital, another Nuffield Health hospital or the company. Mr Sameh Dimitri is legally obliged to inform you that he owns an ultrasound machine for veins used at the Nuffield Health Chester, The Grosvenor Hospital. 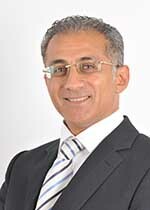 Mr Sameh Dimitri does not hold any paid advisory role(s) at this hospital or on behalf of Nuffield Health.